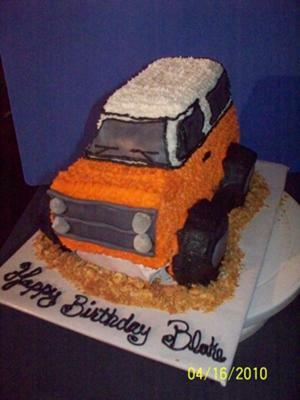 To make this truck cake, I used 2 loaf pans and some small round pans I found. I used one cake mix. Bake according to directions and let cool completely. I iced in buttercream and only added fondant for the grill, windows, back bumper and hub caps. I used gum drops for the lights. And I crushed up some graham crackers for dirt.